Properties in Thompson Arena average 4.8 out of 5 stars. Sterling Cottage: Two Miles from Woodstock Village Green. Property 7: Sterling Cottage: Two Miles from Woodstock Village Green. Cabin in the Orchard near Silver Lake * Ask about a Back to School Discount! Property 8: Cabin in the Orchard near Silver Lake * Ask about a Back to School Discount! 3bed/1bath wood cabin on trout and bass pond - Sleeps 5 people. Property 9: 3bed/1bath wood cabin on trout and bass pond - Sleeps 5 people. Charming Cottage For 4 on Lake Fairlee With Pottery Barn Furnishings. 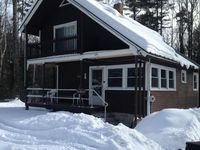 Property 12: Charming Cottage For 4 on Lake Fairlee With Pottery Barn Furnishings. NEW LISTING! 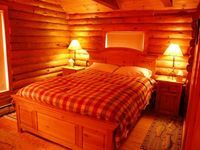 Cozy Log Cabin, Close to Activities and Private, Nature is best RX! Property 24: NEW LISTING! Cozy Log Cabin, Close to Activities and Private, Nature is best RX! Sugar Hill Cabin in Royalton VT. Perfect for large families. Sleeps 24 in beds! Property 25: Sugar Hill Cabin in Royalton VT. Perfect for large families. Sleeps 24 in beds! We spent a wonderful, peaceful weekend at this unique sun-filled home. Beautiful kitchen and sitting room. Cabin was clean and warm. Slept 7 of us with no problem. Communication with owner was very good. He provided all needed information ahead of time.